Netflix has unveiled the first trailer for season three of the sci-fi anthology series Black Mirror. The upcoming season will feature six new episodes, with the trailer showing fans of the series can expect more mind-bending stories set in new/alternate worlds. The third season will arrive on October 21, 2016 and will feature Bryce Dallas Howard, Alice Eve, James Norton, Cherry Jones, Wyatt Russell, Alex Lawther, Jerome Flynn, Gugu Mbatha-Raw, Mackenzie Davis, Michael Kelly, Malachi Kirby, Kelly McDonald, and Faye Marsay. 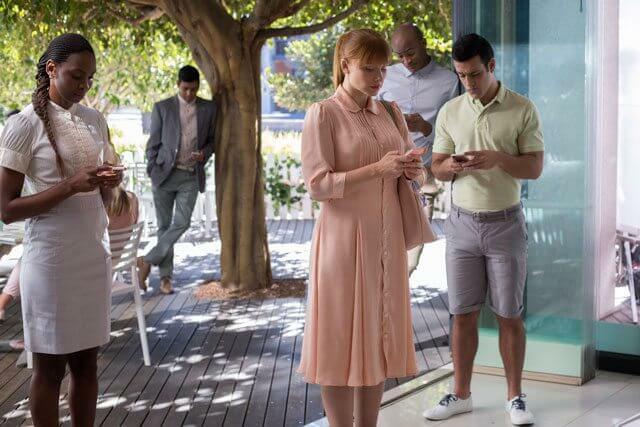 The Plot: Black Mirror taps into our collective unease with the modern world and each stand-alone episode is a sharp, suspenseful tale exploring themes of contemporary techno-paranoia. Without questioning it, technology has transformed all aspects of our lives; in every home; on every desk; in every palm – a plasma screen; a monitor; a Smartphone – a Black Mirror reflecting our 21st Century existence back at us. The series has been recognized with an international Emmy Award, a Peabody Award, a Rose D’Or and been nominated for a BAFTA® award.